A powerfully moving film, and McConaughey's extraordinary physical transformation is much more than a stunt. Like a Gary Cooper in the era of sexual crisis, McConaughey hits a very sure stride. This true story is no melodramatic probe into an ailing cowboy's soul. Not once does McConaughey look to the sky and ask why him or cry himself to sleep as the clock ticks on his nightstand. Dallas Buyers Club is just about a selfish boor who arguably gets a pass in terms of posterity, because while looking out for No. 1, he paved the way for change for everyone else. The real halo here belongs to McConaughey. He does justice to Ron's story and to his own quicksilver talent. "Dallas Buyers Club" takes a more elliptical, near-poetic approach to the lives it portrays than the viewer might expect from this kind of movie. This is McConaughey's movie, and definitive proof that he is back to being the actor we always thought he was, or could be, since "Dazed and Confused." This is a movie that traffics in deep hindbrain emotions: fear and rage and lust and, above all, the pure animal drive to go on living. Despite its clichéd elements, "Dallas Buyers Club" is a fierce celebration of the unpredictable power that belongs to the outcast, the despised, the pariah. It's a remarkable story, vividly and urgently told by French-Canadian director Vallée from a pointed, schmaltz-free script by Craig Borten and Melissa Wallack. Matthew McConaughey brings a jolt of unpredictable energy to "Dallas Buyers Club," an affecting if conventional real-life story of medical activism. McConaughey proves he has evolved from a handsome lightweight to one of the most talented, risk-taking actors in Hollywood. [McConaughey and Leto] elevate the movie beyond ordinary biography or overplayed tragedy, and give Oscar-worthy performances in the process. Matthew McConaughey continues to amaze. Script and pacing problems aside, Dallas Buyers Club remains an awards-worthy showcase of McConaughey's and Leto's ferocious talents, matched only by their astonishing physical decline onscreen. It's McConaughey's spiritual transformation that is most remarkable. His gaze is at once desperate and challenging. [Matthew McConaughey's] explosive, unerring portrayal defines what makes an actor great, blazing commitment to a character and the range to make every nuance felt. The commitment McConaughey brings is something to behold ... Woodroof's mix of Texas blowhard and eccentric bozo is clearly his strong suit. If there was any doubt that McConaughey is more than just a tawny-chested rom-com stud, there should be no question anymore. Vallee directs ''Dallas Buyers Club'' with a loose naturalism, seedy environs and lively humor that prevents the film from becoming over-sentimentalized. Dallas Buyers Club represents the best of what independent film on a limited budget can achieve-powerful, enlightening and not to be missed. Dallas Buyers Club fits our Breaking Bad moment perfectly, offering a difficult hero whose personal code takes on an intriguing coherence. 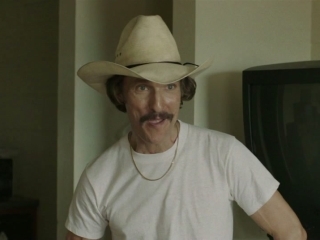 What's remarkable about Dallas Buyers Club is its lack of sentimentality. The movie, like its star, is all angles and elbows, earning its emotion through sheer pragmatism. Despite its downbeat context (a plague at its height), the movie is a crowd-pleaser-graceful and funny enough to distract you from its gaps and elisions. The movie adds vulgar emotional sweetener. It's Erin Cockovich. For the majority of the time, it wrestles with the heavy material like the cowboys and cattle at the rodeo that frames its events, and McConaughey proves himself a proficient rider. There's still something undeniably moving about the film's trajectory, which allows McConaughey to blossom into an empathetic figure-one whose homophobia fades as his fighting spirit intensifies-without losing his rapscallion spirit. If the camera occasionally suffers a fashionable case of the jitters, the movie transcends its agitated verismo to impart dramatic and behavioral truth. McConaughey is the only reason to see Dallas Buyers Club, but he's enough of a reason to see Dallas Buyers Club. [McConaughey] delivers a twitchy, hostile performance on par with anything he's done since he escaped the rom com cul-de-sac. This is a full-bodied characterization that will take McConaughey's already impressive career regeneration several steps further. The fireworks caused by pitting never-say-die Texas bravado against heartlessness is a powerful mix, and the film manages to be an inspiring tale amidst all this sadness.